If caught outside in the winter, a winter survival shelter is necessary for the survival of you and your family, as severe cold winter conditions can lead to hypothermia and ultimately death. Your location, its topographical features and the amount of time you have to plan will dictate the type of shelter you can build. An important safety precaution is whatever shelter you build, be sure to consider proper ventiliation, as asphyxiation is a danger when trying to keep the cold out or heating with fuels that compete for the oxygen in your shelter. Cutting dry hard packed snow in blocks about three feet long, eight inches deep and 15 inches high. Placing the blocks in a circle, stacking them, leaning them inward building a type of dome. Digging a hole to gain entrance into the structure. Creating air holes for ventilation. For an igloo, you need a lot of hard packed snow, which usually is not found outside of the arctic, but you can buy snow molds from Outdoorpros or Amazon. The molds make snow blocks smaller than the ones you cut from the snow so it takes longer to construct your shelter. You simply pack the snow into the mold to form the snow blocks you need for your igloo. 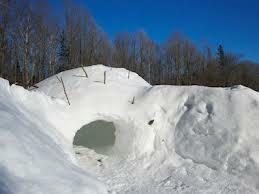 Another option for a snow winter survival shelter is a snow trench, where you dig into the snow to make the trench. You cover the top with branches and/or a tarp for a roof. 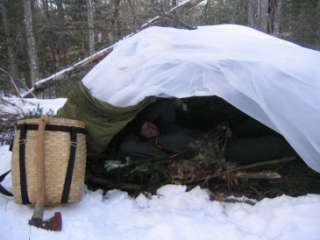 You should not lie in the snow but use pine boughs, brush or a tarp to insulate your body against the cold of the snow. Unless your snow shelter is very large, you should build your fire in a separate outside space. Having a fire inside the shelter, you have the risk of asphyxiation and destructive melting of your snow shelter, leaving you wet and susceptible to hypothermia. Framing - Using bendable saplings for a frame can create a dome like structure. You can use tree limbs to frame a teepee type of structure or even a hut. Walls - To insulate against wind and cold, you can use branches and brush to build walls. If possible, you can use the vegetation to camouflage your winter survival shelter so it blends into the surroundings. 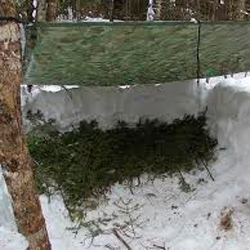 Using pine boughs with the needles pointed to the ground will cause the rain or melting snow to flow off the shelter rather than into the shelter. With great care, you can build a small warming fire pit in the entrance of the shelter or outside of your shelter. Since brush is highly flammable, you need to use extreme caution. Caves offer a ready-made shelter but you should be sure no large, meat eating and/or territorial animals have already made it their home. You check that the rock is stable and not likely to crumble in large chunks, that it is a dry cave and that you have enough room and ventilation for a fire. The city setting provides a broad opportunity for survival shelters. You can use Styrofoam, cardboard boxes and even furniture to insulate from the winter cold. It is important to provide adequate ventilation and to build the shelter so it does not draw unwanted attention. If your home is usable, cutting, taping and insulating cardboard to make a sleeping container will help you retain or regain body heat. Do not use camping stoves or heaters until you have made sure you have plenty of ventilation for a source of fresh air to prevent carbon monoxide poisoning. A winter survival shelter needs to keep you and your family warm as it protects you from the elements. As with all preparation for catastrophic events, you should practice your skills by building the shelters before the day when your survival depends on it.